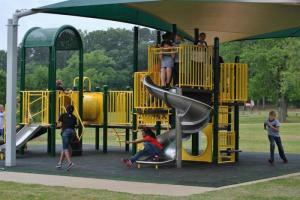 Duncan Park consists of approximately 12 acres of open play areas as well as athletic facilities. All of it is interspersed among pecan, oak and bald cypress trees. The facility includes a variety of amenities for all ages. Duncan Park is located on the corner of Arlington and West Vaughn Avenue.